Blacklist Website - Protect Your Business Website Now! A blacklist refers to a collection of IP addresses that are believed to distribute spam. Emails from these addresses are either routed to the recipient's spam folder or blocked. Spam filters are used for identifying blacklists, and these filters use set criteria to identify emails that are believed to be of a spammy or malicious nature. Even though web applications are believed to simplicity the users’ online experience, they also allow hackers to implant malware into websites. Web applications could turn into a threat if proper monitoring is not executed. It is possible for servers to expose a specific site to security threats. Most servers on the Internet function on extremely simple and vulnerable platforms like the FTP servers. There could also be issues related to the configurations and setup of these web servers. A number of administrators overlook these issues and indeed fail to install the correct security mechanisms. This results in hackers easily making their way to the targeted websites. Simple passwords make it easy and “simple” for hackers to access a particular website. They very easily compromise its security systems and spread malware in order to reach sensitive data. Password sniffing is now becoming a common occurrence because of the increased use of FTP connections known for their vulnerability. They make it easy for Trojans to enter and “sniff” the user’s login details, which are later used by hackers to access the user’s websites and spread malware. People visiting the “affected” sites expose their personal data and websites related to them also become vulnerable. 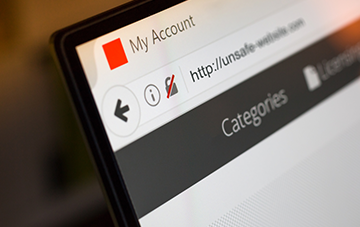 Protect your website and prevent it from getting blacklisted by using the Comodo cWatch Website Security Platform. Comodo cWatch Web is a Managed Security Service ideal for websites and applications. This web security tool is available with a Web Application Firewall (WAF) provisioned over a Secure Content Delivery Network (CDN). It is a fully managed solution provided by a 24x7x365 staffed Cyber Security Operation Center (CSOC) of certified security analysts and is powered by a Security Information and Event Management (SIEM) capable of leveraging data from more than 85 million endpoints in order to detect and mitigate threats even before they occur. cWatch Web is considered to play an efficient role in protecting websites and preventing them from getting blacklisted as it also includes another key feature that focuses on malware detection scanning, preventive methods and removal services to enable organizations to adopt a proactive approach that will protect their business and brand reputation from infections and attacks. Online merchants and other service providers handling credit cards online are provided with a simple and automated way to stay compliant with the Payment Card Industry Data Security Standard (PCI DSS). The CSOC is recognized for detecting and analyzing threats and then performing the necessary actions essential for maintaining optimal security. The CSOC extends a customer’s internal IT team’s capacity to protect websites, systems, applications, and networks and manage complex security incident investigations. Malware Monitoring and Remediation: Detects malware, provides the methods and tools to remove it, and prevents future malware attacks. Cyber Security Operations Center (CSOC): A team of always-on certified cybersecurity professionals providing round-the-clock surveillance and remediation services. Web Application Firewall (WAF): Powerful, real-time edge protection for websites and web applications providing advanced security, filtering, and intrusion protection. Secure Content Delivery Network (CDN): A global system of distributed servers to enhance the performance of web applications and websites. PCI Scanning:Enables service providers and merchants to stay in compliance with PCI DSS. Security Information and Event Management (SIEM): Advanced intelligence capable of leveraging current events and data from 85M+ endpoints and 100M+ domains.